This tablet has pressure sensitivity, but unlike the Cintiq I had access to earlier this year, it doesn’t detect tilt-motion from my wrist. To be honest, so far I don’t miss that aspect of the tablet, and really love how lightweight and mobile it is. I don’t even mind the fact that it’s not wireless. It feels very similar to what a sketchbook is like, and instead of hunching down over it, I’m looking up at a screen. I’ve been trying to gather resources to build a nice “digital workspace” for myself. This includes going through the art magazines I’ve purchased over the last few years and copying the resource CDs that came with them, to scour them for content. Many magazines, ImagineFX in particular, have downloadable tutorials and brushes in each magazine. Every so often they’ll have some really beautiful art inside and I’ll pick one up. Now, I have a chance to take advantage of the Photoshop brushes and tutorials they offer. While going through one of the tutorials, I learned that some artists use 3D software to simulate models to use as reference. What a brilliant idea! My next thought was, what software should I use to do this? 3D software can get pretty expensive and can be very complicated to learn. After some research, I came across the Daz 3D Studio software. To my surprise, it is freely and legally available right now! This will be hugely useful when trying to come up with realistic lighting and anatomy references! I was skeptical at first since it seems too good to be true, and was afraid it would end up being trial software, but found an article explaining why the devs decided to make it free. They have customization packages that you can buy to add-on to the software, but on its own it’s more than enough to give me anatomy reference. They have landscape modelling software I’m going to look at as well. This brings me to the next part of the workspace: software. There are so many programs out there for digital artists, so which one is the best? The answer to this greatly depends on what kind of art you like to do, and who your audience is. While I was researching different software online, including Corel Painter and Easy Paint Tool SAI, I found this Fur Affinity forum thread. A user by the name of Arshes Nei compares sketching and painting in 6 different pieces of software, results shown below. It’s highly educational and totally worth checking out! Paint Tool SAI has become very popular as of late because it’s a lightweight piece of software (in comparison to Photoshop and GIMP which can be resource hogs, and slow down your computer) and is relatively easy to find. I’m going to play around with that a bit, keeping in mind that when I eventually get a Macbook (way down the road when I stop being a poor art student), I’ll have to switch to something else since there’s no Mac version. I’ll end this post with my Foundation Computer final project. We used Adobe Illustrator frequently in that class and I fell in love with vector drawing. Our final project for the class was to do an animation, any way that we wanted. I used Illustrator to draw the frames and put them together in iMovie. I recommend watching it in the highest resolution available on Youtube’s website. Enjoy! I opened Youtube to watch a video earlier in the week and saw that it had suggested a few speed-paint videos. I love watching artists go through a piece, and I’ve been looking for some inspiration to start a manga-like illustration, so I went for it and subscribed to these three artists. Even though they’re using digital methods, a lot of the color work translates pretty well to traditional media. Some of the drawings are even “sketched” beforehand and inked afterwards. I was really interested in the way she shades fabric, especially the skirt and sleeves. I also really love the character’s eyes. Like an artist who flips a sketchbook around to draw something at a better angle, the canvas here is zoomed in, out, and flipped quite a bit. This one goes from sketch to finished product. The artist here uses Paint Tool SAI to their full advantage, transforming and realigning shapes that manually you’d have to erase and re-draw. Here the artist starts by inking a sketch and then blocking in some basic colors. There’s a really cool bit at around 7:35 where she creates her own brush of snowflakes. Rather than painstakingly draw snowflakes on the dress one at a time (and warping them around the fabric), she draws a few and then sort of “stamps” them on, editing them to fit the dresses curves as she goes. Really cool! Can’t do that in the traditional world though… Again, her eyes are really beautiful. After looking to other artists and manga for ideas I started to do some sketches of my own, and it was evident that I needed some anatomy practice. I’ve been drawing a lot of animals over the past little while (foo dogs, owls, etc) and haven’t done much in terms of the human figure since those figure-drawing studios I did in the winter. Drawing faces and the figure feels a bit foreign, so I went over to Posemaniacs, loaded up some tunes and sat down for some sketching. I’d like to fill a few pages of sketches every night until I get comfortable with the idea of drawing poses again (and hopefully get better at it as well). First sketch in the new place! That’s not everything from the past few days, either. The sketchbook is filling up quickly! Drawing gestures is great and a good backup plan in case I don’t feel like working on anything original. It’s very relaxing to turn on some music and fill up some pages. Hopefully the paint is mostly dry on my models painting, so I’ll be back into that pretty soon as well. Fashion illustration is a specialized kind of art, different than what I’m used to doing. Negative space plays a huge role in drawing your eye around the drawing. The model needs to be attractive enough to show off the clothing without distracting from it. Sara Ligari mixes lush watercolor illustration with the world of fashion for pieces that instantly draw the eye. I love her combination of vivid colors and flowing lineart! Most of the detail work in her pieces is dedicated to the outfits in question, but occasionally strays to other elements of the work like accessories and makeup. The careful watercolor splashes above her legs give the illusion of fur, contrasting nicely against the pen work of her lace top. I love those shoes! Drawing shoes, and feet for that matter, has always been challenging for me. When I was younger I would draw people and cut their feet out all together, but now I know better. The detailing on the straps of her sandals is really lovely. The way the above drawing is composed leads me to believe that it might not be fashion illustration, but rather an ad for a skincare or haircare product. Her greens are very vibrant and refreshing; maybe this was drawn for spa-related? Her linework varies quite dramatically, leading me to believe that she works with calligraphy pens and brushes. This method takes a lot of patient but definitely pays off, helping the work to pop and giving it lots of character. The majority of her work uses detailed outlines and contours to form the outfits and models who wear them. I especially like the way she details hair, very believable and flowing. Bodies aren’t fully detailed, with foundation shapes sometimes left in the final drawing. This gives depths to the bodies and faces but at the same time downplays them so they don’t draw away too much attention. The above piece shows that her style is varied and not centered on pen contour drawings. The blending with watercolors here is expertly done, especially with the eye which is very lifelike. By using a few key paint strokes, she’s able to convey the detail in the hat without drawing 100% of it for us. This style sort of makes me think of what you would see if you glanced at someone on the street as they walked by; getting the main idea and colors of the outfit. Happy Monday everyone! For the canadians among us, enjoy the rest of the long weekend! I was on Facebook the other day when I noticed a music theory image that my older brother had posted. Right away I noticed that it looked like a color wheel, and asked him if there was any significance to the colors used for specific notes. It’s an interesting phenomenon that I haven’t really explored because I figured it was just a quirk of mine, one among many. Wanting to look into this in depth, I decided to come up with a playlist of songs, in as many different styles as possible, in each key of the musical scale (A, A#, B, C, etc all the way to G#). Using this playlist, I would paint a color wheel, with a sliver designated for each note. Initially I was worried that the color distinctions between notes wouldn’t be strong enough, but I was quickly proven wrong. I also thought that I’d be able to narrow it down to one color per note, but I was only able to do that using individual notes on a keyboard, and not songs. Songs are made up of so many different arrangements and instruments that it would be nearly impossible to sum it all up with one color. Instead, I blended a multitude of colors and textures, inspired by whatever I was listening to. If anyone’s interested in the playlist I used, leave a comment and I’ll share it. I don’t know that I really learned a whole lot with this exercise, but it was really fun to do and a subject I’d like to explore more in depth in the future. More often than not I have some kind of music on while I do art and I’ve certainly painted some things with certain music in mind. It’d be great to understand this a little better and tailor paintings to music, or vice versa. In the future I’d like to make more color wheels using major, minor and harmonic minor scales. Wanting to try something different after all the painting I’ve been doing, I decided it was high time I got back into sketching. Here’s a thirty-minute sketch of my desk that I did earlier last week. I tried to keep it fast and loose, not focusing too much on details but paying attention to the way objects were placed against each other. My desk is normally very cluttered; I attempt to clean it up regularly, but more art materials come in to fill the space again. This was a fun, relaxing drawing. I’m going to make it a point to sketch more often! Good drawing skills are the foundation for almost everything else in the art world, after all. I’ve only made a little progress on the models painting, brightening the two dresses on the left and refining the design of the middle dress slightly. I’m starting to think that I should let it dry as much as possible, in case we end up moving in the next few weeks. Tim’s had a few opportunities to talk to people in Halifax and my fingers are crossed! I am dreading the moving part a little bit though, just because we’re going to have to go through all the stuff we’ve accumulated in the past 6 years living here. You can be sure that I’ll be making room for all my art supplies, though. Enjoy the rest of the week! Looks like we have a heat-wave coming, meaning wide open windows if I’m going to take this oil project any further. A lot got accomplished over the weekend; I hashed out two more rough sketches, completed pencils for one piece and got ~75% of its inks down! It feels so good to pencil and ink again. There’s a sense of satisfaction that comes after I finish inking a piece. When I first started experimenting with markers, it was a long time before I even felt comfortable coloring originals (I would scan or photocopy them and color that instead). Tim was gone for the weekend so I was able to crank up the music and get stuff done. Even the kitties were getting a bit lonesome by the end of it. 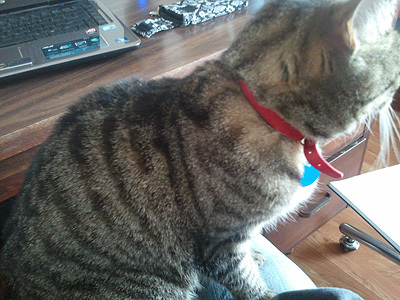 Mocha on my lap, helping me draw. 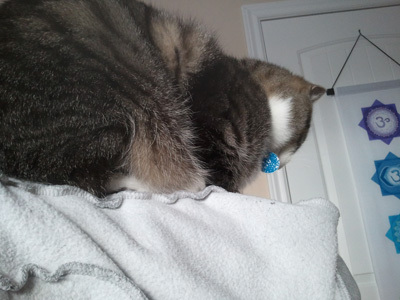 Java perched on top of my chair, supervising. When I was doing research for this project I found that owls were referenced in a lot of different lore concerning both life and death. 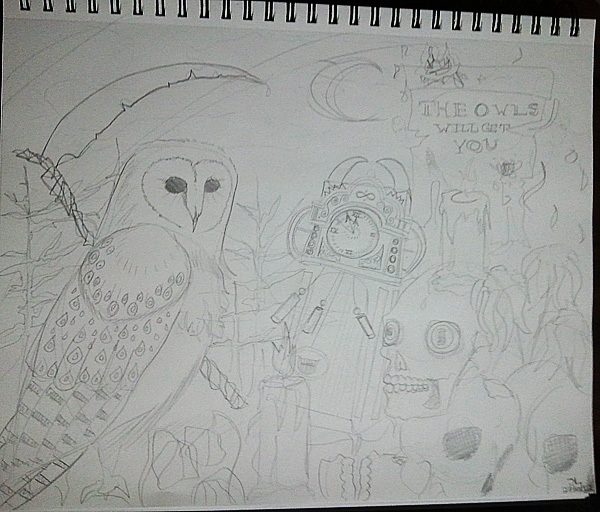 Because of this, I decided to do a series of three drawings to explore the different takes on owls so I could include everything I’d found. In order, my drawings represent life, guidance and death. I’ve snuck in more references to mythology than I can name and it’s been lots of fun! Here’s what I’ve got so far. As I get further into each piece I’ve been starting to think about what kinds of colors I’m going to use. I’m looking at really bright colors for “life” and subdued darker colors for “death”, but I’m not sure how to tackle the “guidance” one. Alongside this project I’m going to try and continue working on the Chuck Close self-portrait study. It stares at me every time I sit down and I won’t be satisfied until it’s done. Can’t wait to bust out my new copics! I keep getting distracted by chores and my espresso maker breaking on me, but I was able to get quite a bit accomplished on Monday night. I’m so close to finishing my latest painting! Tim needed a subject for his on-going 365 project so you can all reap the benefits of a higher quality progress photo. I need to clean up a little more of the text and make sure the edges are all touched up, but otherwise there shouldn’t be much more to do on this. Can’t wait to finish it and put all this stuff away! 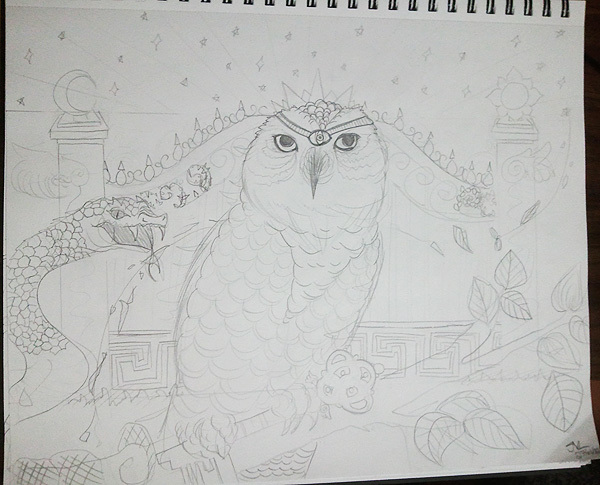 This sketch will be the first in a series of three on the different lore and stigma associated with owls. 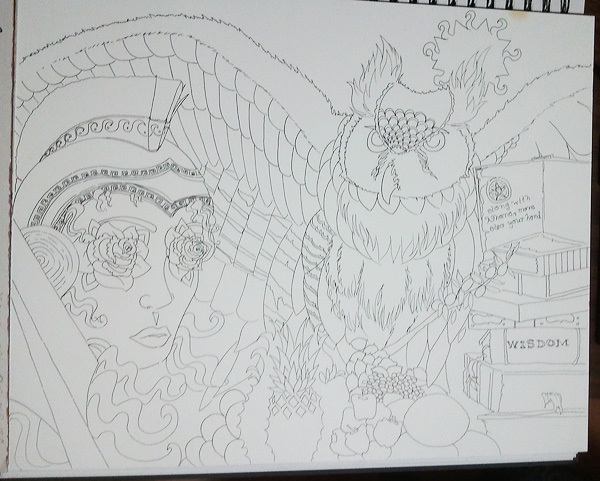 The first will be the owl meaning life and knowledge. 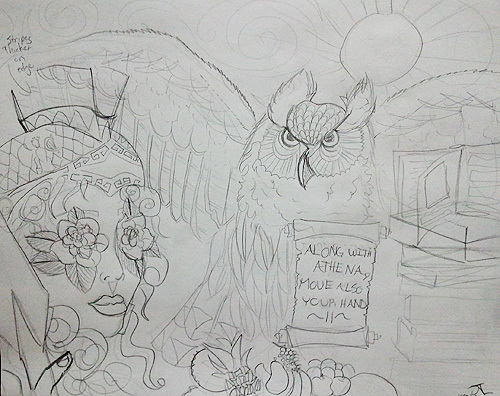 I found a lot of reference to owls in association with Athena and since I used to be really into Greek lore, and wanted an excuse to try drawing a tattoo-style gypsy, I figured I’d give it a go. I might move her and the fruit on the bottom up a bit so everything is framed a little better, but this is pretty close to what the final inked drawing will look like.